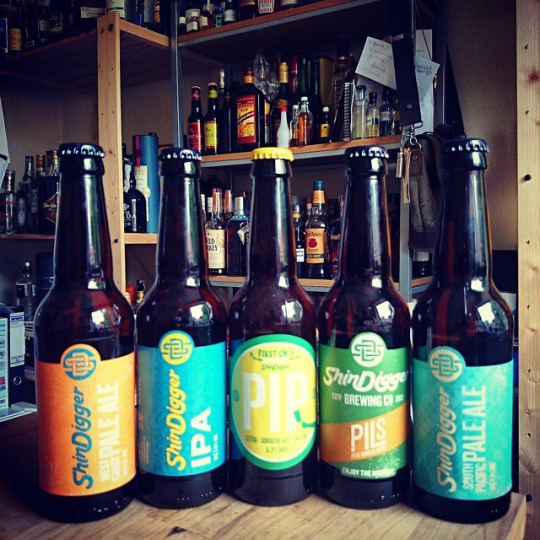 ShinDigger is a part of the wave of craft ales that hit the many pubs, bars and restaurants around the UK. Formed back in 2013, this Manchester based brewery has seen itself organically grow and produce a selection worthy of any major brewery. But how did this all come about? The two owners, Paul and George, are alumni of Manchester University, and when not studying, they invested jointly in a home-brewing kit. Using the space in their kitchen to brew, and the basement of their student house to ferment, they started to sell their freshly brewed beer in the scene they knew best – house parties. In the Autumn of 2013, they applied and received a small loan from the government and expanded the business to include the producing of ShinDigger kegs. This kick-started the growth of seeing their ales within bars and pubs around Manchester, riding on the popularity with students. Within the 1st year, 5 expressions were launched and now use the sub-letting of a variety of local breweries to keep up with the demand. Using hops from the American West Coast. Soft citrus and caramel upon the nose, with hints of dry lemon peel coming through. Light, soft and subtle flavours of dry citrus upon the palate, with a short finish that offers a subtle freshness combined with a slight bitterness. Using hops of the Southern Hemisphere. Soft with a slight sweetness of caramelised fruits on the nose. Smooth upon the palate, with caramel, red fruits and natural sweetener coming through to complete a lingering finish. Fresh on the nose with orange and apricot aromas present. Quite sharp on the palate, but softens to a tart, lingering finish with plenty of orange rind and a smooth finish of light, delicate citrus. Conditioned for 3 weeks and dry hopped with Aussie hop Vic Secret and US hop Simcoe. Dry, delicate aromas of herbs and oak on the nose. Soft on the palate, with an immediate dry texture that delivers subtle herbal flavours on the lingering finish. Lively dry hops with plenty of tangerine and earthy aromas coming through. Soft upon the palate, with the dry hops coming through again, offering a sweet fudge flavour. It develops into a tart oak hit on the long, dry finish.